What happened in 2016: Scott Van Slyke missed almost four months of the season after two trips to the disabled list with back and wrist problems. He did not play after Aug. 7, and his disappointing season ended with wrist surgery in September. The Dodgers were the worst team in baseball against left-handed pitching in 2016, collectively hitting .214 vs. southpaws. Van Slyke, with a career 138 wRC+ vs. LHP, was missed greatly. His injury plagued season was one factor in the Dodgers’ historic woes against lefties. 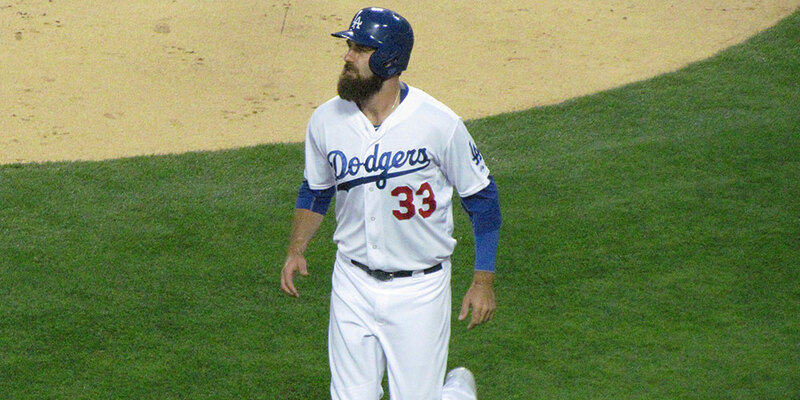 Van Slyke was placed on the DL the first time a week into the season with lower back irritation, causing him to miss nearly 50 games. Then he missed the last 51 games of the regular season with right wrist irritation. His season prematurely ended when it was announced he needed arthroscopic wrist surgery to clear out cysts and scar tissue, a procedure he underwent in September. SVS had wrist issues in the past, like when he was unable to play in the 2015 NLDS against the Mets due to wrist inflammation. The wrist injury was unfortunate, because SVS had started to pick up the pace after he returned from his first DL stint in June. He hit .271/.345/.313/.658 in July, and it looked as though the Dodgers’ plan to use him as an outfield platoon player could have really helped against left-handed pitching. Unfortunately, the tall bearded outfielder only was able to collect 42 plate appearances against southpaws over the season, hitting .243/.333/.405/.739 with one home run against LHP in 2016. The Dodgers hope that SVS can return to 2014 form when he had a career-high .910 OPS in 98 games, but his performance has disappointingly declined since, and his OPS fell to .700 in 2015 and .606 in 2016. 2017 status: The Dodgers signed Van Slyke to a one-year, $1.325 million contract on the first of December, avoiding arbitration. He has one option year remaining, giving the Dodgers flexibility if he doesn’t look like himself anymore. If he is healthy coming into spring training, he will be valuable off the bench and as an extra outfielder and first baseman.